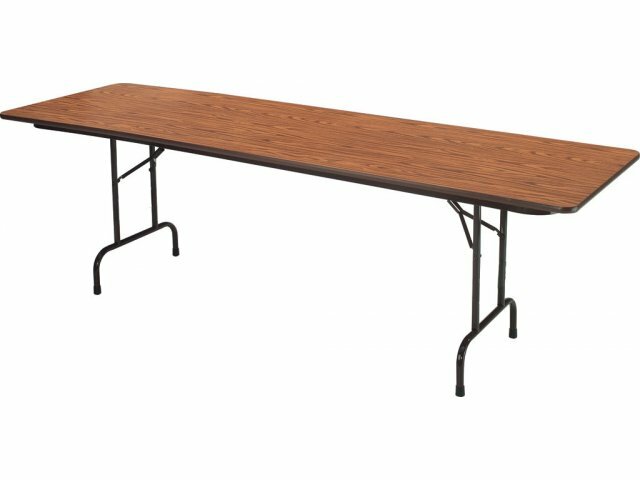 Duralam Top Rectangular Folding Table 72"x36"
Duralam Stain-Resistant Top Folding Tables are popular tables used in many institutional settings. With economical materials and a smart design, these folding tables are an excellent choice for many venues and purposes. Whether you are looking for general office-use tables or seminar tables, folding models will make setup and cleanup much smoother. Melamine-covered surfaces will maintain their sleek appearance even after repeated use. An automatic lock-open mechanism will keep your folding tables standing strong from the first dance to the final toast and beyond. For maximum flexibility and convenience, there is no better choice for your school or company. Smart Materials: The melamine-covered top with bullnose extruded edging protects a particleboard core. Sturdy Build: The 18-gauge steel pedestal legs and one-piece steel apron provide proper support to the tabletop. Floor Protection: Mar-proof plastic foot caps prevent scratching when tables are being moved. Safe Design: An automatic lock-open mechanism ensures that tables will remain in place until you are ready to move them. Great Options: These tables come in a wide selection of sizes and colors.